Turbula - Music - Review of "Songs from the Road"
The late Jeff Healey burst on the scene during the '80s blues renaissance, a blind singer/guitarist who managed to play fast, clean lead guitar and, with the guitar in his lap, doing a lot of the fretting with his thumb. The Canadian musician released several discs of originals and fiery covers of blues-rock standards through the next decade, and even became a jazz music expert and trumpet player, releasing three discs of jazz music. Shortly before he passed away too young at 41 in 2008, he went back to his roots with "Mess of Blues," a blues-rock project (released after his passing) that found him back in the bar-band element that got him started and featured four live tracks that were among the best cuts. A new disc of entirely live material, "Songs from the Road," is out and picks up where that one left off. Recorded at several venues in 2006 and 2007, the disc features Healey on nine of the eleven lead vocals  and he is a serviceable singer. The real attraction is the guitar work, though, and many of the cuts are bar-band vehicles for blazing solos. Healey does not disappoint. After Mark Knopfler's "I think I Love You Too Much," Healey tears through "I'm Ready" and "Stop Breaking Down," with fast and fluid blues lines; he even has a second guitarist on board (Dan Noordermeer) who isn't bad. The Beatles "Come Together" works very well, with a slick lead guitar outro that sounds like the song was written for it. Healey takes the listener for an Eric Clapton crash course with "Hoochie Coochie Man" and "White Room" back to back, and both sounding as good or better than the Clapton versions. (Randy Bachman sits in on "Hoochie," but Healey steals the show.) "Whipping Post" is another winner, with a good vocal and keyboard work by Dave Murphy and Allman-style jamming by Noordermeer and Healey. The only head-scratchers of the set come at the end: Graham Nash's close-harmony "Teach Your Children" done okay but an odd choice, and "Santa, Bring My Baby Back (To Me)," an Elvis tribute that doesn't fit, either. Both are still fun, though. Throughout this disc, the one thing that is evident is that Healey might have been unorthodox and disabled, but he played guitar as well as Clapton or many other so-called guitar gods ever did. 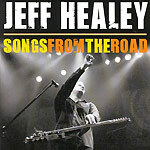 "Songs From the Road" is a chance for fans of Healey to get a live document of the departed guitarist in top form, and for others to get a glimpse of a one-in-a-million talent who was taken from us too soon.